I updated this 1980 Topps #5 card post in 2011: check out the new version! 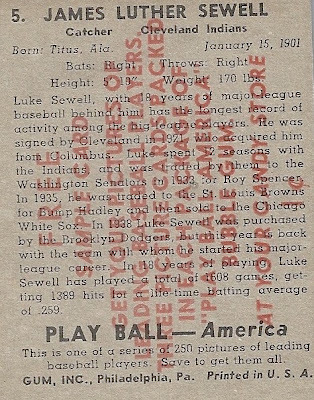 We've gone back to the future by including Luke Sewell, younger brother of previous #5 guest (and Hall of Fame shortstop) Joe Sewell. Though he lacked the elder's powerful stick, durability and defensive skills sustained Luke's 20-year career behind the plate. Several years of managing followed, when he notably led the 1944 St. Louis Browns to their only pennant. That year's World Series also marked the last time both league winners shared the same home stadium. 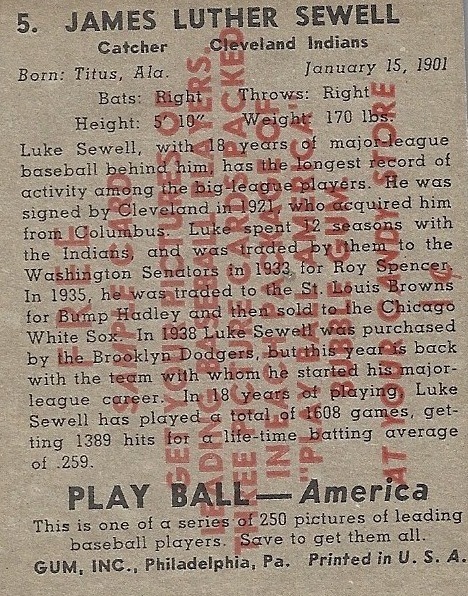 The cross-town Cardinals beat them in a six-game World Series that drew little national interest, given WWII's distractions and the moribund talent levels league-wide. Manufacturer Gum, Inc. used real black-and-white photos on this debut set, splitting the composition between portraits and Sewell-like action shots. 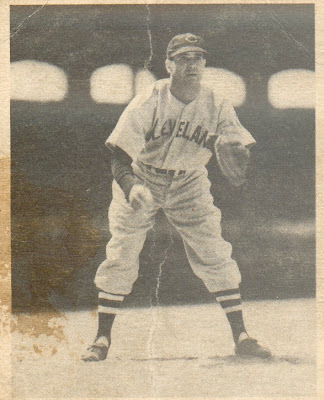 This marked a real change from Goudey's colorful 1930s efforts and Play Ball's follow-up sets (1940 and 1941) continued with a very similar, newspapery look. 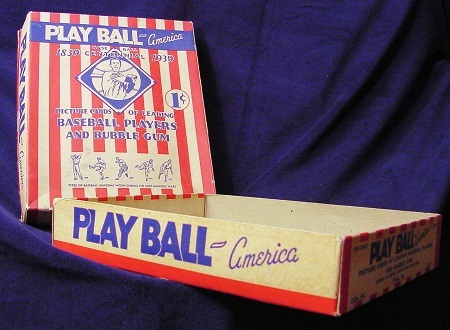 Dozens of card companies tried their hand with baseball in the 1930s, but America's war effort sucked up almost all the cardboard from 1942 to 1947. Only rag stock remained, which led to sets like the poorly regarded MP & Co (checklist at GFG.com). Bowman finally picked up the major league baton in 1948 with a 1939 Play Ball look-alike of 48 cards and Topps finally pushed everyone past the age of small pictures with their 1952 set. Gum, Inc's salesmen brought these overprinted cards to candy stores as promos to build retailer interest. A small number remain in the market and some collectors even specialize in them, though I'm not sure if it's possible to build a full set. 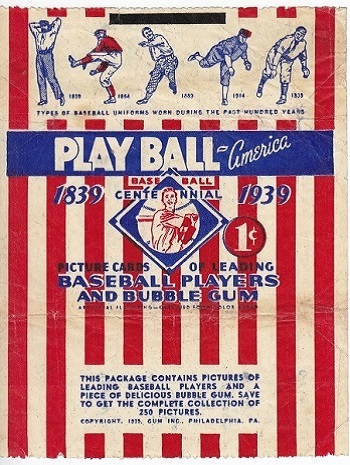 UPDATE: Thanks to 1939baseball.com, we get a look at Play Ball's wrapper and box stylings. Baseball put a lot of effort into celebrating 1939 as the centennial of baseball, so this wrapper included a parade of game uniforms. Value: Low-grade, low series Play Ball commons like Luke Sewell cost a few dollars each. Major stars like Joe DiMaggio and Ted Williams will cost you whatever you have. Seriously, it's enough money that you should just put your wallet in the freezer now to accumulate as much cold, hard cash as possible. Unfortunately, pre-war star card values don't drop much in a down economy, since you only need a few well-heeled collectors to maintain competition and high market prices. 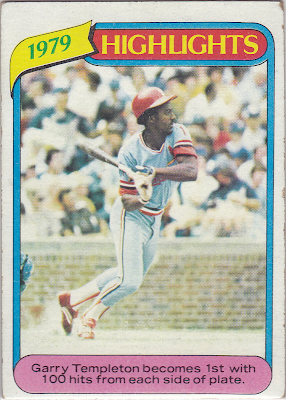 Fakes / reprints: Full set reprints do exist, but probably not singles of Mr. Sewell.